At Sunray, we save you time and money! No matter what the size, we have the expertise and capability to handle the job. 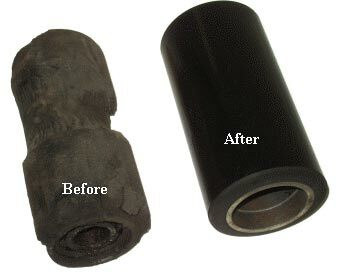 Our wheel/roller refurbishment service can restore your worn wheels/rollers/parts to “like new condition” at a fraction of original replacement cost. Fill out the form below and our staff will email you pricing to recover your worn parts, or contact our sales staff directly at 1 (800) 833-9960 for an immediate quotation for your recovering job. You’ll find our quick turnaround and durable polyurethanes can be the money-saver you’ve been looking for! You can also UPLOAD YOUR DRAWING FILE HERE, for an ultra-fast quote.